As part of the REAL ID Act, Congress amended the Immigration and Nationality Act to restrict judicial review of adverse credibility determinations by immigration judges. The change came in the wake of controversy of judicial reversals of adverse credibility determinations that the reviewing courts saw as inappropriately speculative and lacking in evidentiary support. Critics, including some appellate judges, have in turn alleged that the appellate courts have been insufficiently deferential to the factual determinations of Immigration Judges (IJs) and the BIA. This paper examines the argument offered in support of limiting judicial review in this area, and provides an empirical assessment of the appellate courts' disposition of IJ/BIA credibility determinations in asylum cases in recent years. 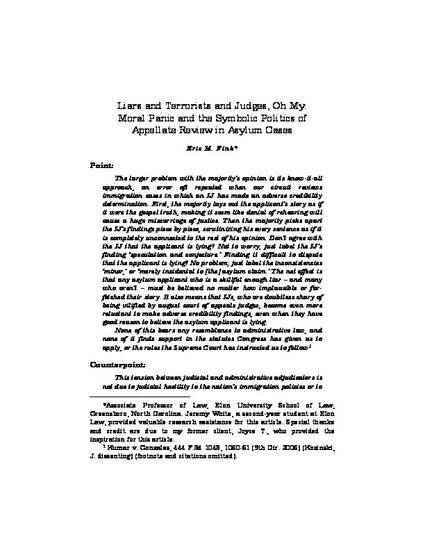 The paper concludes that the stated justifications for restricting judicial review of credibility determinations in asylum cases thus appear to be unfounded. Rather, it argues that the controversy and legislative response can best be understood as an instance of symbolic politics and moral panic.